Lifestyle changes, mouthpieces, breathing devices, and surgery are used to treat sleep apnea. Medicines typically aren't used to treat the condition. If you have sleep apnea, talk with your doctor or sleep specialist about the treatment options that will work best for you. Lifestyle changes and/or mouthpieces may be enough to relieve mild sleep apnea. People who have moderate or severe sleep apnea may need breathing devices or surgery. If treatment and enough sleep don't relieve your daytime sleepiness, your doctor will consider other treatment options. Lifestyle Changes: If you have mild sleep apnea, some changes in daily activities or habits may be all the treatment you need. Mouthpieces: A mouthpiece, sometimes called an oral appliance, may help some people who have mild sleep apnea. Your doctor also may recommend a mouthpiece if you snore loudly but don't have sleep apnea. Breathing Devices: CPAP (continuous positive airway pressure) is the most common treatment for moderate to severe sleep apnea in adults. A CPAP machine uses a mask that fits over your mouth and nose, or just over your nose. The machine gently blows air into your throat. The air presses on the wall of your airway. The air pressure is adjusted so that it's just enough to stop the airways from becoming narrowed or blocked during sleep. Treating sleep apnea may help you stop snoring. But not snoring doesn't mean that you no longer have sleep apnea or can stop using CPAP. Sleep apnea will return if CPAP is stopped or not used correctly. Usually, a technician will come to your home to bring the CPAP equipment. The technician will set up the CPAP machine and adjust it based on your doctor's prescription. After the initial setup, you may need to have the CPAP adjusted on occasion for the best results. If you're having trouble with CPAP side effects, work with your sleep specialist, his or her nursing staff, and the CPAP technician. Together, you can take steps to reduce these side effects. These steps include adjusting the CPAP settings or the size/fit of the mask, or adding moisture to the air as it flows through the mask. A nasal spray may relieve a dry, stuffy, or runny nose. 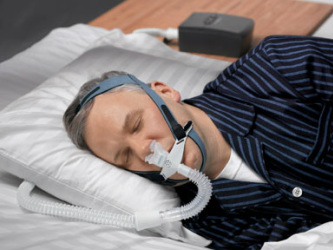 There are many types of CPAP machines and masks. Tell your doctor if you're not happy with the type you're using. He or she may suggest switching to a different type that may work better for you. Surgery: Some people who have sleep apnea may benefit from surgery. The type of surgery and how well it works depend on the cause of the sleep apnea. Surgery is done to widen breathing passages. It usually involves shrinking, stiffening, or removing excess tissue in the mouth and throat or resetting the lower jaw. Surgery to shrink or stiffen excess tissue in the mouth or throat is done in a doctor's office or a hospital. Shrinking tissue may involve small shots or other treatments to the tissue. A series of such treatments may be needed to shrink the excess tissue. To stiffen excess tissue, the doctor makes a small cut in the tissue and inserts a small piece of stiff plastic. Surgery to remove excess tissue is done in a hospital. You're given medicine that makes you sleep during the surgery. After surgery, you may have throat pain that lasts for 1 to 2 weeks.